Each passing year, Madison County becomes more bike-friendly as we make progress on the Cedar Lake Community Trail Project. The trail plan will provide the City of Winterset with a comprehensive map of on-street shared bike routes, pedestrian paths utilizing city sidewalks, and a new multi-use trail that will connect the city with Cedar Lake. Biking is allowed on all city streets, but painted “sharrows” have been added to suggested routes for added visibility and safety. The simple explanation of the in-town shared lane routes is: north-south on 8th Street, 2nd Ave. and 8th Ave., and east-west on Husky Drive, Court Ave., and Benton Streets, plus a few short routes on adjacent streets. For the more serious riders that would like to bike 5-plus miles in town, the city encourages you to take these two loops: east-west loop of Benton and Court to 8th Street and 8th Ave., and north-south loop of 2nd Ave. and 8th Ave. to Benton and Husky Drive (plus a little jog on 4th Ave. and Hutchings). Do this twice and you have a 10.5 mile ride in town. 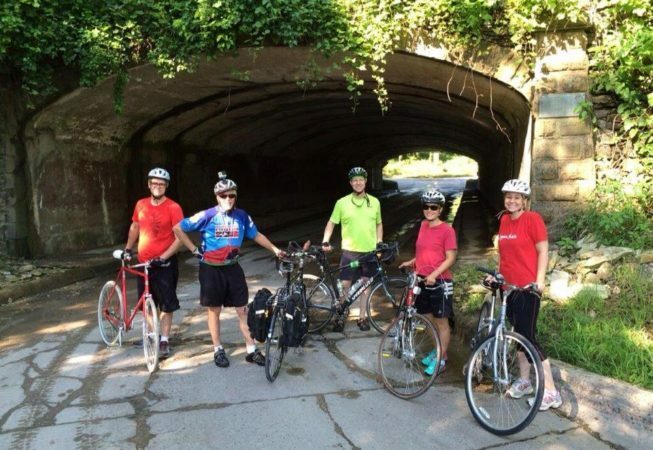 Each year in June, the Madison County Cycle Club hosts an annual ride known as BRAMCO, “Bike Ride Around Madison County.” Riders can choose either a 45-mile or a 60-mile loop, returning to City Park for the famous lunch included with registration. Towns on the shorter ride are St. Charles, Truro, and East Peru. The long loop includes Podunk Center and Macksburg. Three rest stops along the route, staffed by MCCC members, provide water, snacks, and shade.